The Ukrainian president, Petro Poroshenko, on Thursday called on Nato to deploy naval ships to the Sea of Azov to “provide security” amid a deepening crisis with Russia. Nato foreign ministers are due to meet next Monday in Brussels and will assess their existing presence in the area, but it is unlikely they will send warships to the Black Sea. The German chancellor, Angela Merkel, insisted there was no military solution to the Ukrainian-Russian crisis, even after describing Moscow’s actions as unacceptable. She said she would be talking directly to the Russian president, Vladimir Putin, at the G20 summit in Argentina, which starts on Friday. The renewed crisis in Russian-European relations erupted after Moscow seized three Ukrainian naval ships and their crews on Sunday off waters close to the Russian-annexed Crimea. The ships were trying to make their way through the Kerch strait to the Ukrainian port of Mariupol, in the Sea of Azov. Ukraine said Russia used a tanker to block access to the Kerch strait, which under a treaty is shared territory. Russia said the vessels illegally entered its waters. The Crimean courts have put 24 Ukrainian sailors under two-month pre-trial detention. Ukraine claimed Russia was escalating the crisis by imposing a de facto blockade on two Ukrainian ports on the Sea of Azov and barring ships from leaving and entering via the Russian-controlled Kerch strait. Russia has blocked 35 merchant ships from leaving or entering the Sea of Azov, Ukraine asserted. 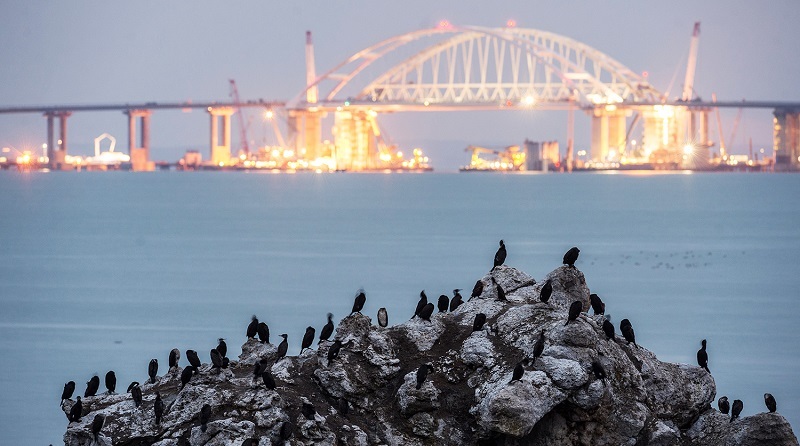 The infrastructure ministry said on Thursday 18 ships have been stuck in the Black Sea, waiting to pass through the Kerch strait into the Sea of Azov and another 17 vessels were unable to sail out of the Ukrainian ports of Mariupol and Berdyansk. The Kremlin denied it was restricting shipping and said if there was any blockage it was due to bad weather. He called on Germany to increase existing economic sanctions against Russia and again urged Berlin to rethink its plans to allow Russia to build a new gas pipeline, Nord Stream 2, which he said would leave the EU even more dependent on Russian energy and deprive Ukraine of badly-needed income derived from its existing pipeline. Merkel insisted the pipeline would go ahead, adding Germany would “ensure Ukraine remains an important transit country”. Speaking at a Ukrainian business forum in Berlin, she said: “I want the Ukrainian soldiers released. We must do everything to help places like Mariupol, which depends upon access to the sea. We can’t allow this city to just be cut off, thus indirectly isolating further parts of Ukraine. The German foreign minister, Heiko Maas, also said military action was disproportionate and had no legal basis. “What we do not want is a militarisation of this conflict, but we want a political process,” said Maas. He said no German warships would be sent to the Black Sea. The call to release the sailors was echoed by the Austrian chancellor, Sebastian Kurz. Russia claims the Ukrainian vessels ignored “the legitimate demands of the Coast Guard of the Border Service and the Black Sea Fleet to immediately halt, and end performing dangerous manoeuvres”. It says a chase involving some gunfire ensued in order to stop the Ukrainian ships, which were detained in Russian territorial waters. The Ukrainian authorities have introduced martial law in selected regions along the border with Russia as well as along the coast of the Black Sea and the Sea of Azov for 30 days. It includes an order that only Ukrainians can enter the country.